NOTES: For the Gundam Universe, includes three figures. Earth. The Future. The human race has spread out to the moon and orbiting colonies, where the poorer classes can actually land-hold. Back on Terra, the rich get richer with the massive amounts of trade goods flooding in from these successful groups. The rather empirical Earth Force does not like the idea of different colonies splintering off and forming their own unions, and tries to stamp out a few rebellions, unsuccessfully. Some of the new federations bond together and actually begin to win back parts of the fed universe in a series of hit and run wars, resulting in a massive death toll for both combatants and civilians. 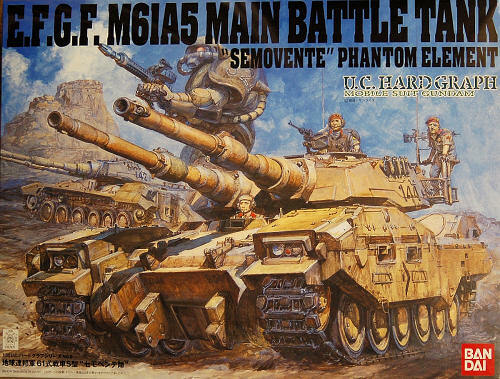 Tanks, of course, are part of the ground conflicts, and the Type 61, with it’s twin 150mm barrels, packs one heck of a punch. Used en-masse, they are almost unbeatable, for the moment. Soon, the newest Mobile Suits will be stalking them, and they will become extinct as the war becomes one of whose technology is better, rather than who has the biggest guns. I’ve seen well made kits. Actually, quite a lot. This one is on top of the stash in quality control. I can not find a single bit of flash, not one sinkmark in any of the moldings. The parts appear to fit together quite well (yes, I am doing a buildup, hold onto your horses) and should make into one great tank of the imaginary universe. The directions are precise, almost a comic book in itself, and though in Japanese with no foreign language translation, it is easy to understand where part 111 goes, etc. They also supply photos of the actual model in case you have any problems with the exploded drawings. The photoetch is crisp and clear, the decals appear to be just thick enough to settle down over the engraved surfaces well. I know a lot of you are having shock at the sticker price, but I do have to say that this model is absolutely exquisite . 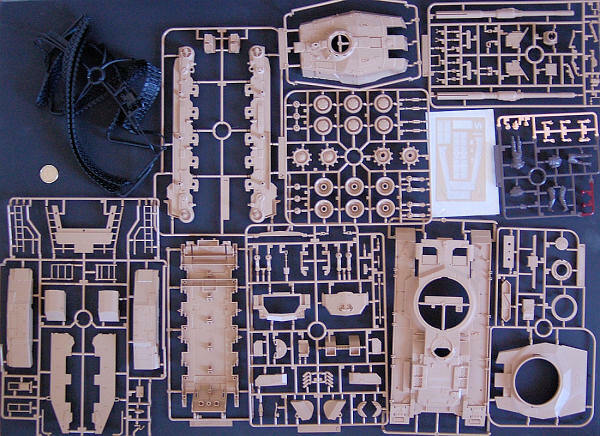 It is also quite massive, as large as a 1/35th Maus easily, and the detail is perfect. The only thing I would change would be the addition of aluminium barrels, instead of the half pipes. If you are into Gundam, this kit is going to add a “wow” factor to your collection.